These Omega 3 capsules will ensure your pet receives a regular intake of EPA and DHA fatty acids. Includes Omega 3s with important nutritive properties which can help to maintain healthy skin and glossy coats. Fish Body Oil, Capsule Shell (Gelatin, Glycerin). For best results add capsules to food and then mix in well. Capsules can be pierced and squeezed onto food if necessary. A bowl of fresh water should always be available. For animals use only. This product is for intermittent or supplemental feeding only. 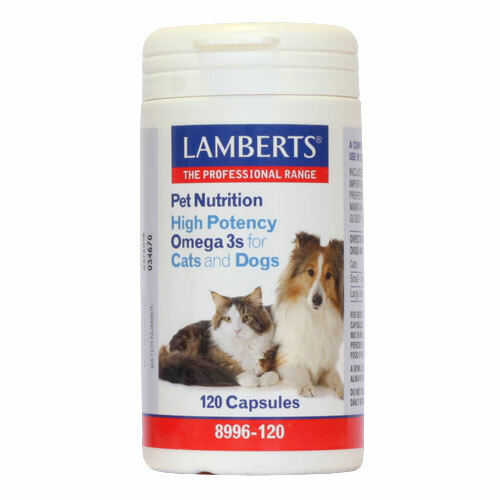 Below are reviews of LAMBERTS Omega 3s for Cats and Dogs - 120 Capsules by bodykind customers. If you have tried this product we'd love to hear what you think so please leave a review.